With Royal Ascot kicking off today we thought we would share with you our favourite contemporary designer millinery, with a nod to vintage inspiration, in a hopes to inspire you. Silk flowers, check! Veiling, check! Classic base, check! This beautiful Alyssa – Medium cocktail hat from Jane Taylor Millinery has it all. 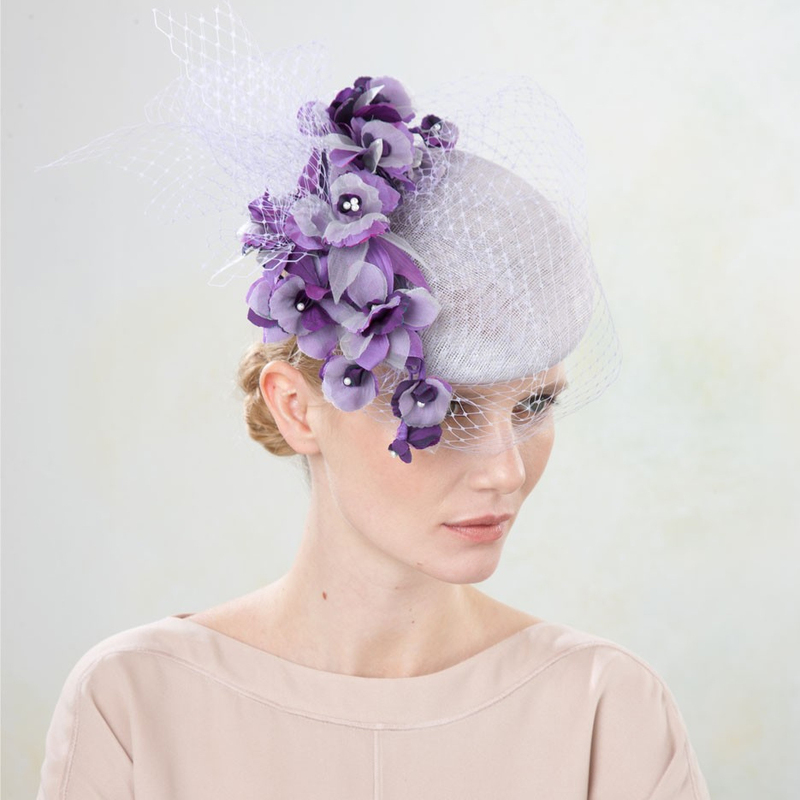 The stunning silk orchids cascade around the hat and finished with a delicate veil it perfectly frames the face. This would look stunning with a floaty lilac 1930’s bias cut silk chiffon dress to match. We love the classic 1950’s shape to this gorgeous creation from Gina Foster. For ease of wear it is attached to a headband and should be worn at a tilt to get that classic 50’s look. Made from pinok pok coulis, the ‘Pero’ hat is simply chic and elegant. Can’t you just imagine this being matched with a 1950’s Dior-esque ‘New Look’ suit. Proof that hats at Ascot don’t have to be OTT to grab attention, sometimes timeless elegance will suffice. This offering from Sonia Yewdall has a distinctly 1940’s feel to it. There is nothing better than a simple hat with beautifully crafted flowers, Sonia Yewdall seems to draw on this inspiration and we just love this offering from her. We just love the clean look she has created and how luxurious her hats are. Be sure to take a look at her website! There were SO many John Boyd designs we could have chosen to showcase in this post. All his designs are delightfully colourful, exotic and creative. This one pipped the others to the post however as we love the 1940’s ‘Turban’ look he has created here. Can’t you just imagine an exotic actress sashaying in a pencil dress with this beautiful creation wrapped around her, giant sunglasses giving her an heir of mystery and anonymity……………….what a beautiful daydream! Be sure to check out the whole gallery at John Boyd Milliner’s website for plenty more ‘statement’ pieces. No inspiring hat post would be complete without a completely OTT oversized hat! And this creation from Juliette Butterill Millinery fits the bill perfectly. Again teamed with giant sunglasses you will be turning heads as you walk around at the races. A classic hat finished with a swoosh of ostrich quills for that extra drama and finesse. Become one of Betty’s Belles. Sign up for exclusive news.